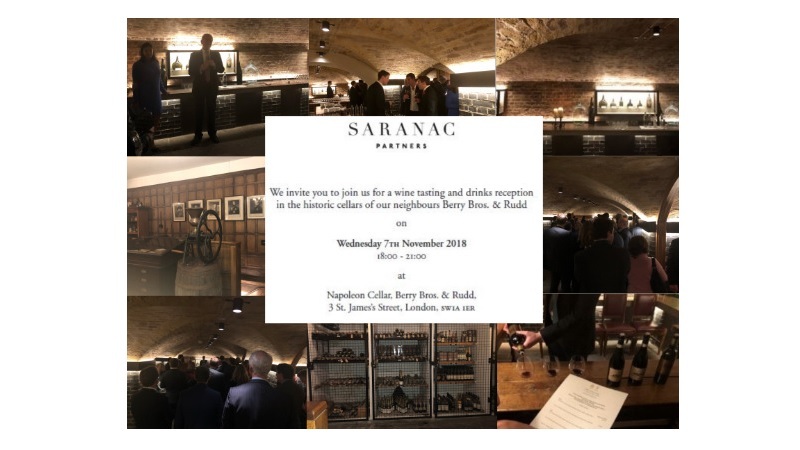 On Wednesday 7th November, Saranac Partners hosted clients, partners and friends for a wine tasting in the Napoleon Cellars at Berry Bros & Rudd. The purpose of the event was simply to say thank you to all those who have supported the business in our first 18 months of operation. Both Robert Elliott and Tanvi Davda spoke to re-affirm the firms gratitude to all those who have been involved in getting the business to where it is today, especially to the firms early clients. It was great to see so many friends of Saranac Partners together and we are looking forward to many more evenings like this in the future.